1. Winterwood – EBSQ Artist Mark Satchwill, may be best known for his portraits, but he proves he can paint anything with this wonderful winter landscape. 2. EBSQ January Exhibits – Today is the first day to vote in January’s online exhibits. We have two shows: FOTM – Mixed Bouquet and Norse Mythology. 3. Getting Ready for the Circus Show – Claudia Roulier shares how the background of her paintings evolve. 4. How to Choose the Best Social Media Outlet – Don’t have time for multiple social networking sites? All you really need to do is pick the right one for you and your art. This article from EmptyEasel.com shares some great tips! EBSQ’s Mark Satchwill has long been known for his watercolor paintings, particularly his portraits of amazing accuracy and depth. Over the last year, Mark has taken those skills and applied them digital painting. I had a virtual sit-down with Mark to discuss this transition, his challenges and passion. Can you tell us how and why you ventured into digital painting? There were a few factors involved. One was simple curiosity – I was seeing a lot of digital art around and wanted to try it. I was also doing regular illustration work and had ended up with a big pile of drawings that were just taking up space – I figured if I began to do that work digitally it would save on space and materials! I also felt I needed a new challenge, something new to learn. So, I bought a drawing tablet and then did some research to decide which art software to buy (I bought Painter, ArtRage and Manga Studio), then set about learning to use them! What have you found most challenging when working in digital? I think the hardest thing was learning to use a tablet and pen. It’s almost like learning to draw again, as instead of looking down at your hand on the paper as you draw you, your hand is drawing on the tablet and you are looking at what you’re drawing on the screen – so there is a disconnection that takes some getting used to. I think the other challenge is to retain your own artistic personality and style. So much digital art has a rather generic look to it, it’s lacking that stamp of personality that traditional has but I think coming to digital with good traditional skills makes a big difference in your approach. For you, what is the biggest difference when using digital vs. traditional tools? I think it’s the freedom digital allows. As I don’t have to think about buying new materials or wasting materials I can be free to be more experimental. I’m free do much larger work as I don’t have to worry about space. Thanks to working with layers if I paint something and it doesn’t work or I mess it up I can just delete it rather than have to start the whole image again from scratch. And there’s no mess or tools to clean up! Have you encountered any issues selling digital art compared to traditional? Yes. I think there are a couple of reasons. One is that if you purchase a digital artwork you purchase it as a file or a print, so that feeling of buying a physical object that someone has created isn’t there. I think people will gradually come around to the idea though. 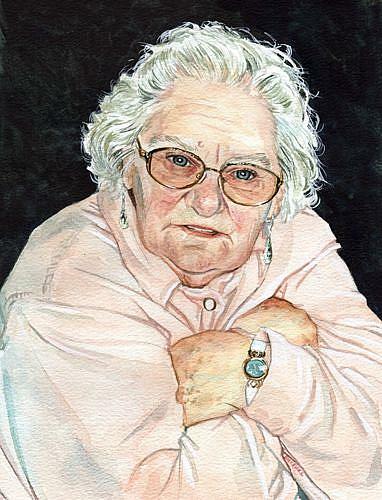 The other reason, relating to my own work, is that people have got to know me for traditional watercolour work and are less receptive to my digital work. I think there is mistrust from many traditional artists about digital – they think that it’s trickery and that it’s somehow easier and needs less skills, that it’s sort of cheating. Of course there are tools that can be used to cut corners if you want to but if you don’t have the basic traditional skills they will only take you so far. Ultimately digital is just another medium and it’s the end result itself which is most important. I’ve barely scratched the surface of what’s possible and I’m loving working digitally. It doesn’t mean I will totally give up working traditionally – there is plenty of room for both! My name is Mark Satchwill and I’m an artist and illustrator using both traditional and digital media. I live in Watford, a small town on the outskirts of London where it’s far enough to be green and leafy but close enough that it’s just a short train ride to all the city has to offer. I live with my partner Mike, our dog Dexter and cats, Will and Lyra, and a couple of demanding chickens. I don’t really remember! I do remember hearing about it and thinking it was another fad and being wary at first but I still joined up. I soon realised it was quite a useful tool in many ways. I joined in late 2007 and then set up my art page at the beginning of 2010. Though a lot of my regular Facebook friends follow me on the art page, it was set up as a place to send people who were interested in or who had purchased my work but who I didn’t necessarily want to share my day to day non-work stuff. Remember it’s a tool to use. If people have joined your page it’s because they are interested in your work, so post regularly and interact, even if it’s just saying thank you if someone comments. The big difference between a blog or website and a Facebook page is how easy and direct communication is, so make use of that, because many people enjoy the interaction with the artist. Direct people to your page from your blog etc. using the available widgets and links. I guess just the fact that it’s so direct. If you post a new work you get feedback almost straight away (or not!). There will be more of the NoHo Noir series which I illustrate and collaborate on with writer Katherine Tomlinson, and we hope to have an e-book version for sale soon. I’ll also be doing more digital paintings, possibly a new historical series. I’m also planning to do some work for a graphic novel. Thanks for talking to me! 1. Ashleigh – Mark Satchwill is an amazing portrait artist. Check out his latest marker portrait. Yes, markers! 2. The Etsy Front Page Debate – Don’t miss this informative post by Jennifer Lommers on selling at Etsy and being featured on the front page. 3. Asleep by the Window – Erika Nelson has a wonderful post up on her latest DPW painting and how it came to be. Awesome! 4. Interactive Art Print – Kim Niles of KiniArt has a new print on Zazzle that allows you to change the color of one aspect in the art print (I’m not telling which one). I had to give this a go! 5. Tarot Drawing and Prizes – Misty Benson is holding a drawing for some amazing prizes, but she needs your help. Check out her blog for details on her Kickstarter Project, how you can help and how to enter the Tarot Drawing! My name is Mark Satchwill and I reside in Watford, a town not too far from London in the UK. Well I started a blog nearly four years ago now. Originally I intended to use it like a diary, not so much about my work but about my life etc. The art took over and I realised that it was still a diary of sorts. Though I have a website, to keep it updated is time consuming. A blog takes five minutes to update, so it doesn’t remain static, so it’s a very useful tool. I generally add the work the day it’s finished with a few words on the piece. I’ve also sold though the blog and regular customers can cherry pick the work they want as it gets put up on blog before it’s listed elsewhere. Any tips for other EBSQ bloggers? Try to direct customers to your blog. While it’s great to have other artists and friends following what we do, it’s generally non-artist’s that are the buyers. Think of it as a tool so make sure you have links to any places you sell and tag the posts carefully. Well, I have an enormous music collection which ranges from the 50’s to now. I rarely don’t have music on whatever I am doing. Recently I’ve been listening to Kap Bambino, Nerina Pallot, Paloma Faith and Fever Ray alot. I have more still life planned and would like to do more portraits and florals….a bit of everything! I also plan to do some larger pieces this year. Thank you Mark for the an EBSQ Blogger of the Week!